Red Dead Redemption 2 cheats have been revealed, and they will certainly help out players with their horses, ammo, health, and more. After several years of waiting, Red Dead Redemption 2 has finally arrived and reviews promise another epic entry in the Rockstar game series that equals (or surpasses) the original Red Dead Redemption. The game is also Rockstar’s most ambitious outing yet, with a storyline that’s approximately 60 hours in length. Beyond that, however, Red Dead Redemption 2 is filled with side content and little details that should give fans hours upon hours of enjoyment. In a lot of ways, the game is an amalgamation of past Rockstar titles and their features only perfected for the modern era of gaming. Of course, in some ways Red Dead Redemption 2 harkens back to a classical era of gaming. In no other area is this clearer than in the addition of cheats, which has long been a staple of Rockstar games (especially the Grand Theft Auto series). It’s not exactly surprising that they’d continue this tradition, but the way in which the publisher has implemented cheats this time around is certainly unique. 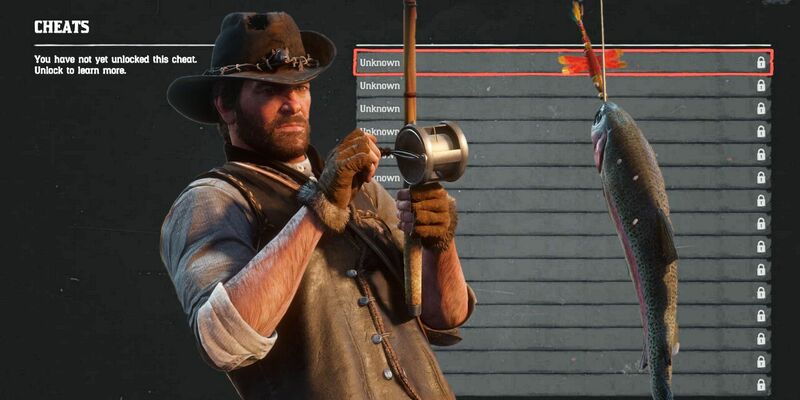 This guide will inform players not only how to access cheats but will provide a full list of all cheats available and how they work within the massive world of Red Dead Redemption 2. Read on below for all of your cheating needs. Unlike Grand Theft Auto 5, which took a classical approach to cheats with button combinations to use cheats, Red Dead Redemption 2 will require a little more work on the player’s behalf. To unlock a good portion of these cheats, players must find key phrases on the back of newspapers. This will utilize the game’s “flip” option, and requires the player to pay close attention to items they come across during gameplay. To enter a phrase found, simply go into the settings and press triangle or Y, depending on a player’s platform. Effect: This cheat provides the player with infinite ammo for all weapons. Required Item: New Hanover Gazette No. 27, which can be bought in Valentine during Chapter 1. Effect: Adds Pump-Action Shotgun, Bolt Action Rifle, Mauser Pistol, Semi-Automatic Pistol to inventory. Effect: Reveals entire map to player. Effect: Sets Deadeye level to Rank 3 (remain in Deadeye after character’s weapon is fired). Effect: Sets Deadeye level to Rank 5 (shows weak points and vital organs on enemy combatants). Effect: Refills health, stamina, and Deadeye bars to full. Effect: Refills and fortifies all relevant bars. Effect: Call player horse from any distance. Effect: Makes the player instantly inebriated. Effect: Instantly spawns a race horse for player use. Effect: Instantly spawns a War Horse for player use. Effect: Instantly spawns a wagon with a single horse for player use. Effect: Instantly spawns a circus wagon for player use. Effect: Sets player honor to maximum. Effect: Player and horse is granted unlimited stamina. It’s important to keep in mind that there are over 30 cheats in Red Dead Redemption 2 and not all of them (or their exact required newspaper) have been uncovered yet. This cheats guide will be updated as more are discovered, but in the meantime, there are still plenty of useful cheats for players to sink their teeth into. Once again, it’s important to note that achievements/trophies and saving Red Dead Redemption 2 will not be accessible while a cheat or cheats are active.